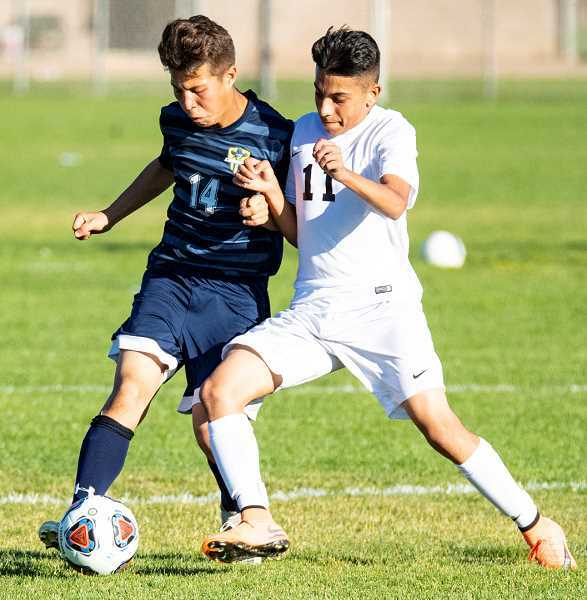 Thursday afternoon, the host Crook County Cowboys had numerous scoring opportunities early in their soccer match against Pendleton, but they couldn't find a way to reach the net. Pendleton broke open a scoreless tie early in the second half of the match as Edwin Linares drilled a shot into the corner of the goal. In the past, the Cowboys might have folded. Instead, they rallied, forcing the action and scoring two second-half goals as Crook County earned their first Intermountain Conference victory and just their second win of the year, 2-1. "I'm very pleased," said Crook County coach Ramon Castaneda. "They played hard to the end, and hopefully, this opens up our game. We talked to them before the game and said it is a team effort when we win, and it is a team effort when we lose, and we played good today." The Cowboys peppered the Pendleton goal with shots early in the match, but the shots either went straight to the Pendleton goalkeeper or were off line. Then late in the half, Pendleton began to gain some momentum, getting a couple of shots on the Crook County goal. However, Crook County goalkeeper Pablo Casado made a pair of great stops, preserving the shutout. Pendleton's second-half goal came just four minutes into the half after a Crook County breakdown. The Cowboys tied the game 14 minutes into the half on a goal by freshman forward Kevin Arroyo. Six minutes later, Arroyo blasted a shot off the post that ricocheted back into play. Crook County continued to pressure but missed multiple scoring opportunities. Then, with 10 minutes remaining in the contest, Arroyo scored again, seemingly putting the game away. However, Crook County made a mistake late in the game, giving the Buckaroos an opportunity to tie the match. The Cowboys had the control of the ball, but an off-line shot gave Pendleton a goal kick. A long kick down the field led to a breakaway by a Pendleton forward, and Casado grabbed the Buckaroo player inside the penalty box. While the Buckaroos were setting up for a penalty kick, Crook County made a substitution at goalkeeper, replacing Casado with Abel Nunez. 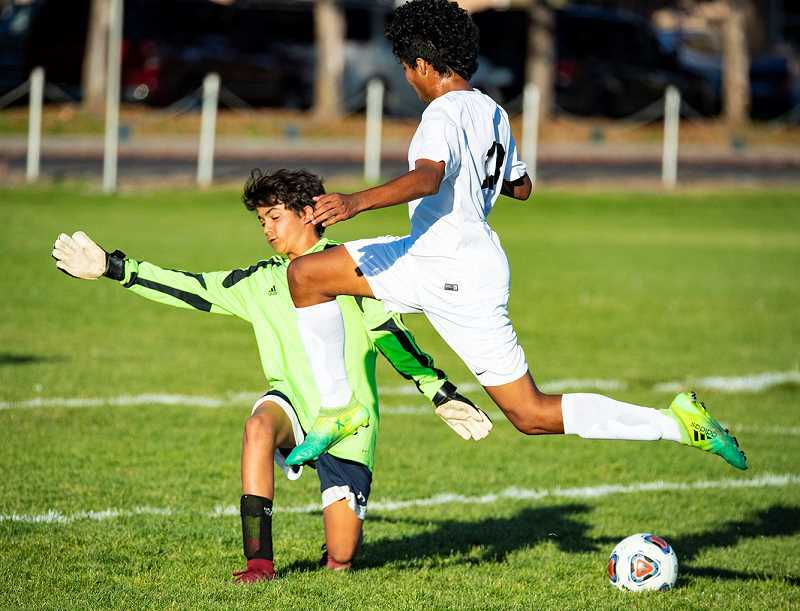 Nunez swayed back and forth in the goal as Pendleton forward Gabe Rodriguez took the kick, then Nunez leaped to the side in an attempt to deflect the shot. That effort turned out to be unnecessary as Rodriguez's shot sailed harmlessly over the goal. Crook County then put Casado back in goal, took the ensuing goal kick and ran out the clock. "It was really important," Crook County midfielder Elias Villagomez said of the victory. "We played our hardest today. We played as a team, and we played really good. You didn't see us screaming at each other. We just played our hardest. I'm proud of how we played today." With the victory, the Cowboys improved to 1-2 in league and 2-5 overall, while the Buckaroos fell to 1-2 in league and 1-5-1 overall. Crook County is back in action today when they go on the road to take on the Ridgeview Ravens (1-0-2, 3-2-2). The Cowboys return home on Thursday to host the Redmond Panthers (0-3, 2-4). Both games are scheduled for 4:30 p.m.